The Tokyo Motor Show is known for its great concept designs. This year’s show did not disappoint. Here is a recap of some of the most intriguing models! You have to see some of these concepts to believe them: http://www.usatoday.com/picture-gallery/money/cars/2015/10/27/wild-car-designs-debut-at-tokyo-motor-show/74667624/ In particular, Toyota Gosei’s “Fresby” is interesting, to say the least. Urethane and airbags make up the exterior, and well, look at the paint job! For some reason, Mercedes–Benz thinks the future might be TRON: http://www.autoblog.com/2015/10/28/mercedes-benz-vision-tokyo-2015/. This self-driver is all about the creature comforts: a wrap around sofa and a wide screen TV make the interior feel more like a living room than a car. This concept is powered by a fuel cell electric hybrid engine which Mercedes believes will provide a 600 mile range. Let’s ignore, for a minute, that the fuel cell infrastructure is nonexistent and too expensive to implement, or that this vehicle retails near $64,000 dollars: http://www.autoblog.com/2015/10/27/honda-clarity-new-fuel-cell-future-vehicle/. Honda’s new Clarity Fuel Cell is a well-designed vehicle. It’s spacious, good looking and the fuel cell range is 435 miles, which I must say is pretty impressive, as is the 3-minute refuel time. Toyota’s FCV concept is not nearly as practical as Honda’s Clarity, but I think it gets points for being unique: http://www.autoblog.com/2015/10/28/toyota-fcv-plus-tokyo-2015/. True, it reminds me a little of Blade Runner, if Blade Runner was a lot less gritty and glowed in a blue, ethereal light. Yamaha’s Sports Ride concept car—yes, Yamaha—is something worth waiting for: http://www.autoblog.com/2015/10/29/yamaha-sports-ride-concept-tokyo-2015/ The Sports Ride is bare bones inside, but if looks are any indicator, it promises to be a nimble and all-around cool little two-seater. This is probably one my favorite concepts from this show: http://www.theverge.com/2015/10/28/9625252/mazda-rx-vision-rotary-engine. 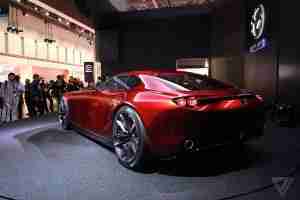 Mazda is returning to the rotary engine! This model is supposed to pick up where the RX-8 left off. And I, for one, cannot wait. The engine is enough to be excited over, but just look at those gorgeous lines. No wonder Mazda’s tagline was “Zoom Zoom”. And it isn’t hydrogen. It’s a rotary combustion engine—did I already mention that? Police going undercover to catch distracted drivers are becoming a frequent occurrence: http://www.autoblog.com/2015/10/29/police-officer-dresses-like-homeless-man/. This time the police are from Maryland. I love how the police officers brag about how many tickets they gave out. But I love even more that the whole reason Montgomery County PD is doing this is to catch offenders: a citizen’s presumed guilt over presumed innocence. I especially love the video clip of officers stopping traffic and moving onto a highway during traffic to issue a citation. Does that seem a little unsafe to anyone else but me? However, to be fair STOP DRIVING DISTRACTED, folks.